In my effort to show the Wall Street Journal’s tech reporter that real household incomes have declined in San Mateo County I dug up and sent a time series comparing 1999 to 2012. 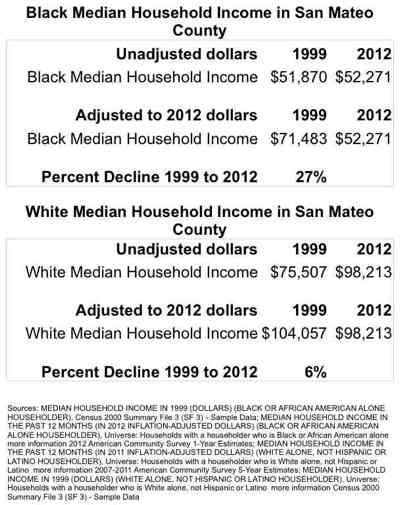 As the table below clearly shows, the median household income for Black families in San Mateo County declined by a staggering 27% over the last 13 years. For whites the decline was more modest, about 6% at the median. What this means is that even the most privileged racial group which has the greatest educational and cultural capital is experiencing downward mobility in the epicenter of the tech boom. Blacks, Latinos, and other more marginalized groups have it a lot worse. And of course these numbers don’t capture the families who moved out of San Mateo County because it has simply become too expensive, so they might even be conservative measures biased by displacement. I showed the WSJ’s Manjoo the above table. He responded via Twitter that he thinks it merely shows the effects of two recessions (2001 and 2007-2010). 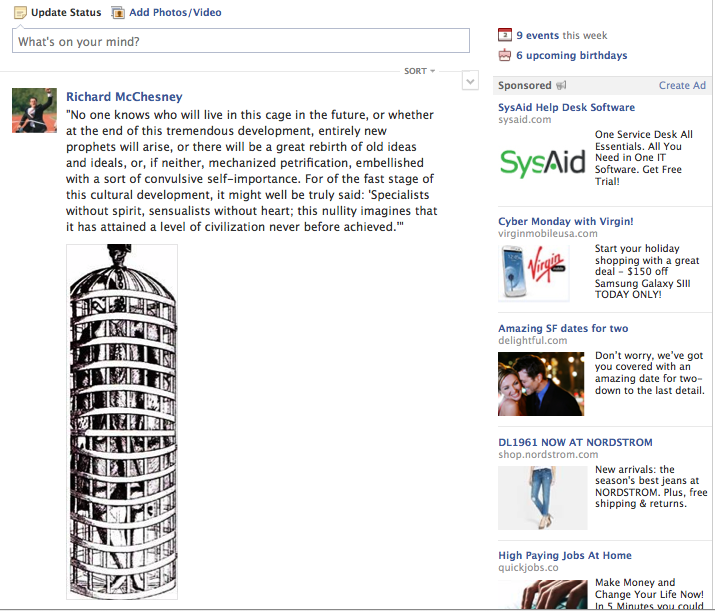 So the tech boom is unrelated? 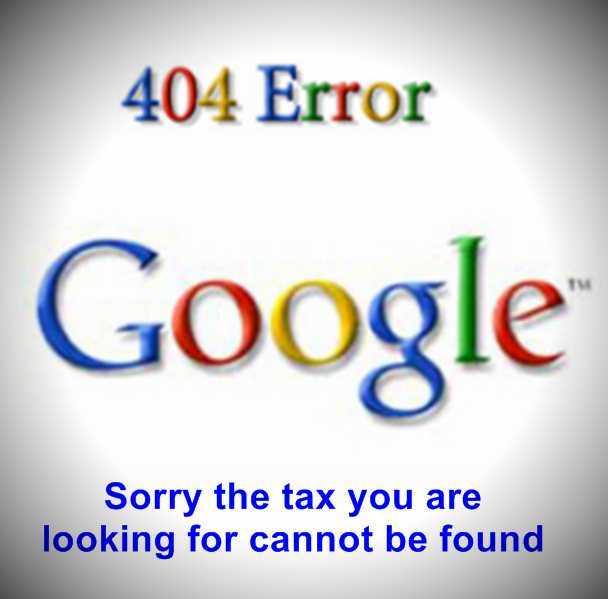 He then stated that what matters, in his opinion, are the income gains experienced since 2010. In 2010 the national economic recovery began, and it coincides with the heating up of the latest the tech boom in Silicon Valley and San Francisco. 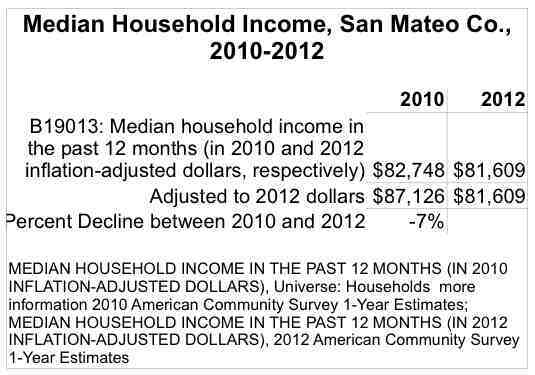 So what happens if we look at household incomes in San Mateo County since 2010? We find yet again that most households are losing out, in spite of, or perhaps because of the tech boom. Since Manjoo chose the words “paycheck” and “workers,” you’d think we can safely assume he’s trying to tell us something about the real incomes of the majority of the labor force in San Mateo County, the Bay Area’s tech epicenter. He’s not. This is misleading and it undermines anything further Manjoo might have to say about economic inequality in Silicon Valley. Not that he tries to say anything substantively about it anyway. His article shrugs off growing inequality while offering up anecdotes and de-contextualized factoids he says show how tech wealth is being spread around. To be fair, Manjoo does point out that the dramatic spike in wages in 2012 was due to the Facebook IPO which minted more than a few millionaires. That event skewed the county’s average upward. But while the BLS wages statistic helps Manjoo talk about the princely incomes of the tech elite, it leaves his argument devoid of any accurate information about how income is actually distributed in San Mateo and the wider Bay Area. He ponders the lives of nomadic twenty-somethings who live out of their cars and spend their days trying to build startup companies in hackerspaces. He doesn’t spend any time thinking about half of the region’s workforce employed in low wage service sector jobs, amassing debt, afflicted by housing insecurity, with little promise of advancing. Without finding a stat to actually measure workers incomes he can say nothing of substance about the overall equity of the tech boom. Given this fact you’d think Manjoo would ditch his unreliable “rising paycheck” statistic for something that actually measures the real earnings of the majority of workers, not wages as they’re defined by the BLS. That sentence is also very misleading and says nothing about human welfare. It’s like saying, because asset prices are high, and because lots of people are technically employed (forget their actual earnings or well-being) then the society is fine. It’s not. But let’s just focus on income, the metric Manjoo never actually measured. When he didn’t actually measure it he couldn’t say anything substantive about the situation of most workers in San Mateo, or the Bay Area today. 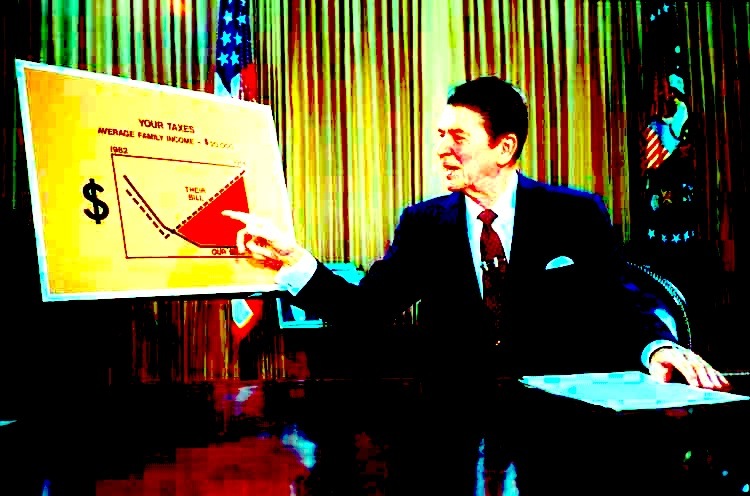 Instead chose to make a Reaganomics argument about how enrichment at the top of society trickles down and benefits those at the bottom. Of course this isn’t true nationally, and every economic and social statistic, from real incomes to health outcomes demonstrates the suffering that growing inequality causes. The trickle down ideology holds no truer for the Bay Area if you actually look at people’s real incomes compared to the cost of living. If Manjoo wanted to actually measure the paycheck of the average worker in San Mateo he couldn’t have picked a more misleading source. The BLS data he used to claim that the average worker earned $81,000 in 2011 is calculated as the mean average of all wages paid to every employee in San Mateo County covered by unemployment insurance. But in the BLS’s survey, wages are defined not just as cash in the form of wages or salary. The BLS includes “non-wage cash payments [including] employer contributions to certain deferred compensation plans such as 401(k) plans and stock options.” That’s the 2012 Facebook distortion right there. Manjoo recognizes this in his article, but he misses the significance of this technical note. What Manjoo fails to see is that 2012 was only an anomaly in absolute scale. Otherwise every year in San Mateo the income figure reported by the BLS survey is greatly inflated by the over-sized compensation packages (that include yearly infusions of stock options) of the thousands of corporate executives who live there. Not only was the 2012 estimate of $168,480 skewed upward, the 2011 average of $81,000 which Manjoo calls a “respectable figure,” and which he assumes is normal, is also already skewed upward. $81,000 would be respectable if it were a remotely accurate estimate of what workers actually earn in San Mateo on average, but it’s not. To understand what workers actually earn today in San Mateo a better source of information is the U.S. Census Bureau’s American Community Survey, 1-Year Estimate for 2012. For half of San Mateo’s labor force, wages fell below $41,274 in 2012. What Manjoo avoids recognizing in his ode to the tech sector is that Silicon Valley is an extremely unequal place, and that this inequality is ripping apart the social fabric. Almost half of San Mateo’s households have incomes under $75,000 a year. Half of the county’s households —which average in size at 2.8 persons— subsist on an annual income that is well below Manjoo’s fictional average paycheck for a single worker. 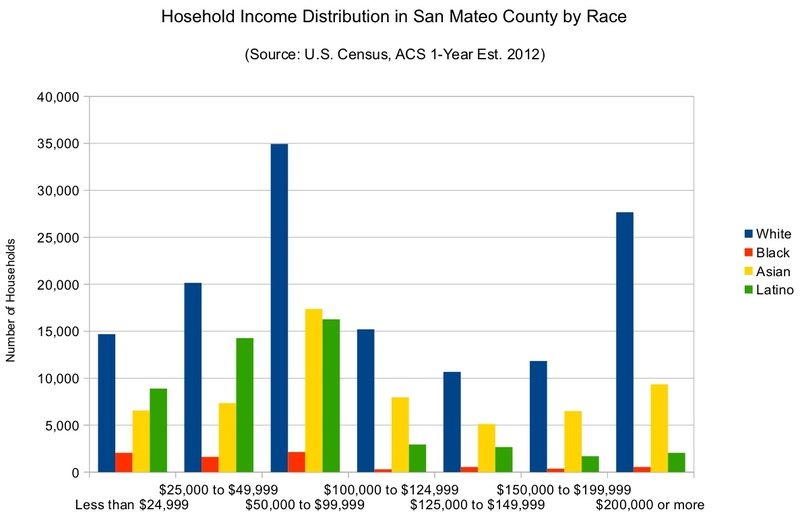 Income distribution in the tech epicenter of San Mateo County is highly unequal. Black and Latino households are over-represented at the bottom the county’s income range. There may very well be 40,000 households (15 percent) in San Mateo County whose income is above $200,000 a year and who are living very well. These are the tech executives, the private equity investors, and the lawyers and banker who work in San Jose, San Francisco, and the suburbs in between. Just the same there’s another 40,000 households that earn less than $30,000 a year. Many of these Silicon Valley denizens at the bottom of the hierarchy are Black and Latino families who live in the shadows of the region’s wealth and glory. Their struggles to survive are rarely reported. Instead “tech journalists” these days run around the Bay Area telling cute stories about killer apps and occasionally lamenting how the hyper-gentrification of San Francisco is paradoxically destroying opportunities for artistic and cultural consumption for the privileged techies. The real big story, however, is the massive redistribution of wealth and power to the top 5 or 1 percent, the shrinking of the middle class, and the immiseration of the bottom half of society. Per capita incomes in San Mateo by race show us that the tech boom hasn’t been good for Black and Latino workers. While white workers make $63,000 per capita, Blacks make only $30,000 and Latinos even less with $20,000. Let that sink in. The per capita income for white San Mateo residents is double that of Blacks and triple that of Latinos. It’s well known that the tech sector is a white and Asian space, that the average software programmer or engineer is a young white or Asian male, and that the upper-most executive posts in tech and along Sand Hill Road (the finance capital for Silicon Valley) are filled with white men. We also know that the tech boom is unequal in terms of gender. To jump right to the point, inequality in Silicon Valley follows a pretty typical pattern of racial and gender hierarchy in which white men rake in the biggest rewards by far, followed by white women and Asian men. 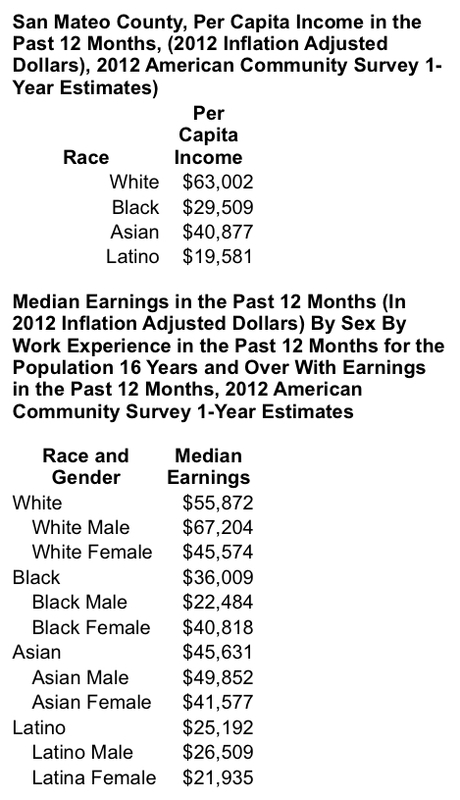 At the very bottom of the income earnings distribution are Latinas and Black men. The median earnings for white men in San Mateo County are 200 percent higher than for Latinas. Half of all Black men in San Mateo earn less than $22,000 a year. Of course only focusing on the socioeconomic statistics of San Mateo creates a skewed picture that itself doesn’t accurately reflect the changes being wrought on the Bay Area by the latest tech boom. The San Francisco Bay region is an integrated and inter-dependent economic unit of nine counties and dozens of cities. The tech sector is geographically concentrated in Santa Clara, San Mateo, and San Francisco Counties. These three counties also are home to the most affluent households in the Bay Area, so any income averages that don’t drill down to particular cities and neighborhoods will be biased upward and the growing poverty beneath the surface will be obscured. Any exclusion of Alameda and Contra Costa Counties —the East Bay where polluting industries are concentrated alongside hyper-segregated Black and immigrant communities— also creates a distorted picture of the Bay Area’s economic transformation.